Introducing a The UPS Store centre into your hotel or convention centre may help streamline operational duties and create differentiation. Guest parcel management, printing and shipping are some of the core services available with The UPS Store on site. The UPS Store centres are designed to coordinate with the existing hotel or convention centre layout and brand standards. With The UPS Store within your location, your employees can focus on providing service to your guests, while The UPS Store focuses on meeting their business needs. The UPS Store centre in your hotel or convention centre can help you to provide excellent additional services to your guests. Integration of The UPS Store can be transparent to guests. For example, charges to The UPS Store centre can become a simple line item on their hotel bill or invoiced direct to your client. Business travelers can send print files online to The UPS Store prior to arriving, and have print jobs produced and delivered on site. Travelers can count on The UPS Store to ship luggage, trade show materials and souvenirs back home. The UPS Store centres provide convenience to guests and eliminate the need to leave your location for their printing and shipping needs. The UPS Store understands how important large meetings and events can be to your hotel or convention centre. Meeting and event planners can count on The UPS Store centres to provide inbound and outbound shipping and storage of event freight materials. Centres help meeting and event planners save time, provide convenience, and have peace of mind. The UPS Store can even meet with event planners during routine pre-event site visits to coordinate shipping and printing needs. 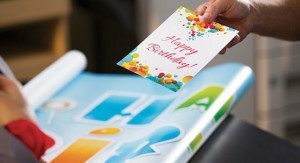 From last minute print jobs, to pre-event preparation, The UPS Store can help make events run smoothly.